Noble Audio Trident review | What Hi-Fi? As far as we know these Noble earphones, although hand-assembled, aren’t crafted by the three Cyclopes that made Poseidon’s Trident. So why the name? Perhaps the fact that each bud has three balanced armature drivers (updated, Noble says, from its previous three-driver design) is a reference to the three-pronged fork. Or maybe they get their name from the military-style hard shell box they come in. Maybe the people at Noble simply thought it was a cool name. Whatever the reason, the Noble Trident earphones have plenty more than a name to catch your attention. For one, there’s the price. 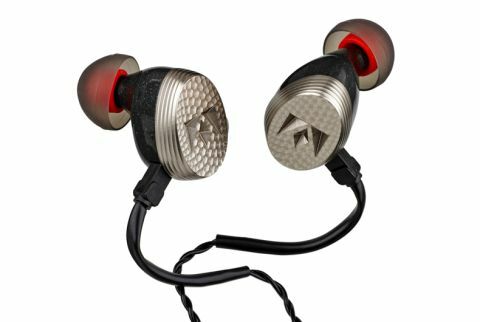 Although here, the surprise isn’t so much in learning that these are the US brand’s entry-level in-ears (of Noble’s new five-strong universal-fit range), but in discovering that some of its models carry a £2000 price tag. You might ask how a pair of in-ears could possibly be worth that. Or £275, even. It’s a reasonable question, and one Noble answers by pointing you to its online catalogue. The more pricey custom-built ones, especially, are works of art. Noble has tried to bring some of that splendour down to this price point. The buds have a lovely speckled grey finish with branded aluminium end caps which stick out about a centimetre from your ear. Noble also makes custom-fit acrylic (Trident C) and silicone (Trident S) versions for £350 and £555 respectively. Despite being clunkier than most, they nestle snugly inside your ear canal without feeling like a burden. Mounting them isn’t too fiddly either once you’ve draped the rubber-coated part of the cable that protrudes from the buds over your ears. The rest of the cable is thick and plaited, which not only helps prevents tangles but makes it less susceptible to airborne electrical interference than a standard straight wire. It also conforms to that premium look and feel too, although it doesn’t feature an inline mic or remote. In this respect, features have taken a back seat to fancy accessories, which as well as the hard case, include a velvet drawstring pouch and belt clip, eleven ear tips (some rubber, some moulds), and – wait for it – an ownership card. Whether or not that is something worth showing off is largely dependent on their sound. From the first listen of Yazoo’s Only You, it’s obvious that the Noble Tridents aren’t your typical off-the-shelf buds. The generous amount of clarity on offer sweeps through the sweet melodic synths and vocal accompaniment, and there’s plenty of refinement, smoothness and even-handed balance to prevent them from feeling too in your face. On a mission to gather detail, the Trident headphones communicate the discrepancies of each twinkling note with apparent ease. The track rarely sounds so intricate. It’s a presentation that’s hard to ignore – even when playing low-res Spotify tracks straight from a laptop. However, we find that putting a DAC between your source and the Trident earphones is necessary to experience the height of their sonic capabilities. Pocket-friendly USB DACs are a good shout if you are looking for something portable for your smartphone. We use the Oppo HA-2 (£259) and immediately hear gains in punch, body and solidity. In Anthony & Johnson’s Kiss My Name, drums fill out, the rhythm tightens up, and the vocals that grace the top of the Chamber orchestration suddenly carry more lilt and quiver. With or without a DAC, the Noble Trident earphones offer a good sense of control, but like an overworked party host, they sometimes sound too busy to have fun. We’d like them to strike down harder on drum beats, and fleet through the piano sequence with more drive. Dynamics could be a little subtler, too. These gripes aside, the Noble Trident in-ears are impressive earphones, delivering a suitably mighty sound to go with their mighty name.